Do you want awesome, eye catching nails? 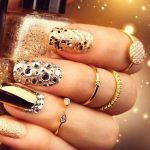 Nails are the new way to express your individuality – shape and length, colors, sparkles, it seems that anything is possible these days, and gel nails offer a perfect solution if you suffer from weak or broken nails. Once only available in professional salons, you can now create perfect nails at home thanks to an ever expanding range of gel nail products on the market. Incredibly durable – gel nails and nail finishes, unlike a regular manicure, don’t look dull after a few days, and will still be pristine in 2 to 3 weeks. In fact, the only reason to remove them is when your cuticle is growing out, or if you fancy a change. Because they can be shaped and trimmed like natural nails, it’s hard to tell the difference between the two, and once you get a coat of gel color on, it’s impossible. They elongate your fingers, making your hand look elegant and eye catching. I love them – there’s nothing like a brand new set of nails, embellished by a beautiful design to make you feel like a million dollars. These are gorgeous – stunning color, so incredibly glossy and seem tough and hard wearing. These nails are easy to use. There’s no sticking your hand under a lamp to cure them or hanging around afraid to tough anything in case they’re not dry yet. Just trim and file if necessary, prepare your natural nail, apply the glue and hold in place for a second or two. Instant elegance. They remained in place for nearly two whole weeks, and I wasn’t kind to them either – lots of washing, messed around with my SUV, and horse riding. I’ll be using these again! Super color, stayed in place for ages, and so simple to apply – perfect. Makartt have produced a super strong, yet flexible, gel false nail. The finish is perfect and should hold any color you wish to apply. These clear gel nails are really durable and went on easily. They felt very firmly attached, and the gel polish just glided on; however, you could wear them without polish as they look so natural. Over the three weeks that they stayed in place for, they didn’t bend or crack at all. These are great nails – super durable and natural looking. And the customer service cannot be faulted! ★★★High Quality Material- Makartt Ballerina Nail Tips are made with high quality ABS material, which is thick and sturdy enough to last about 2-3 weeks. What's more, ABS is a kind of green environmental friendly material, no smell and no toxic to your body or your nails, providing you a safe and comfortable nail doing experience. This product looks really useful and arrived in decent sized bottles. You only need a tiny amount, so they should last a good long time. The little velvet case turns this in to a great gift for a nail art enthusiast. After applying the base coat, you do need to cure it under a lamp, but then you can go to town with colors and finishes. Once these are cured, you brush on the top coat. This product gives an amazing shine to the color and is super hard wearing. I used glitter on the tips of my gel nails, before applying this top coat, causing it to sparkle like a Christmas tree. I love this and plan on using it again and again! Another great product, with lovely packaging. It's salon grade gel nail prep that you can easily use at home. ❤Azure Beauty Base and Top Coat: Long-lasting; Brilliant shine and durable. Required to cure under the UV/LED lamp. ❤The function of base and top coat: increases the adhesion of nail and color gel polish and makes nail stronger. I’m including this lamp in my review as to create the perfect gel nail and polish finish, the nail has to be cured under a curing lamp. This looks well made and easy to use with durable wiring. The instructions are clear and concise. This lamp cures my gel nails very quickly, and unlike many others, I can fit my whole hand, including thumb, underneath it. This means there’s no messing about forgetting which nail you’ve done. This lamp is small and neat, and the only problem is that the cable could be longer, but it’s not a problem as I can just move my table closer! The lamp, by SunUV works brilliantly and my nails cured in double quick time, achieving a gorgeous shine. Highly recommended. 1.ALL-IN-ONE BEST QUALITY SUPERIOR NAIL DRYER: With new professional designed UV+LED dual light source, SUNUV SUN9C nail dryer is applicable to curing almost all nail gels! Its light is closer to white light, has no harm to eyes and skin. Fashionable and durable 50000hrs lifetime, ideal for both home and salon use. This is a nail dryer can help you to solve almost all the curing problem! This is great little set for nail art novices or professionals. Both of these products go on so easily, and the nicely shaped brush means that you only have to use three strokes per nail. They cured really quickly under the lamp and retained their mirror like sheen. Even after two full weeks nothing could scratch or mark them, there weren’t even any stress lines and they were still shiny like new. Love this set! However, the typical nail polish aroma is quite strong, but manageable. A good set of base and top coat that’s durable, super shiny and a great price. Mirror shine finish; proper application that can last 2 WEEKS+. Same brand color gel + top&base coats = best choice. REMINDER: Cure under the UV/LED lamp. One of these bottles had leaked very slightly in transit, but only a tiny bit was lost; I wouldn’t have even noticed except for the tell-tale chemical smell of polish. Both of these coats cured in double quick time, leaving the finish gorgeously glossy and rock hard. You only need a tiny amount of each, and in fact, if you use too much, it doesn’t cure at all. A great top coat and base coat set where a little goes a long way. Apply the polish in thin coat. Thinner - Stronger. BEWARE: May cause ALLERGIC REACTION. Please take SKIN TEST every time before doing manicure. Discontinue using immediately once feeling uncomfortable. This setter coat is designed so that you can use any polish, including traditional ones, just like a gel with all the qualities that gel finishes possess. I tried this with various polishes, including the old style lacquers, and it gave a lovely shine to all. They all had a certain level of durability, but the acrylics and gels definitely worked best with this setter. The advantage of this over a gel top coat is that this dries without the curing process, so if you don’t have a lamp, this is great. For those that don’t have a curing lamp, this is a good alternative, and it’s great for a touch up on the go. essie gel-setter top coat, 0.46 fl. oz. This pack of three products looks great for beginners to nail art and came in a sweet little presentation bag. Used together, these work really well; but they also work just as well with different brands of gel polish. The base coat, and the bond layer prepare the nails for the color, ensuring a tight, durable connection. The gloss achieved by the top coat is stunning, and the finish is tough and strong. I was pleasantly surprised. A great set of products, with all three together providing a perfectly smooth mirror finish that copes with daily wear. It would make a lovely gift for the beginner and more experienced alike. This is designed to activate the highlights in gel polish for an even greater depth of color and shine. I must admit to being a tiny bit sceptical. I followed the instructions, but deliberately chose a different brand of polish just to see the effects, and wow! It really does make a difference. The color almost looked 3D and gained a water-like reflective quality. It also lasted over two weeks on my gel nail tips. Okay, I’m won over – it really does live up to the claims. This is a brilliant product, and you can actually see the difference within the polish itself. Well worth keeping a bottle in your nail tool box. This kit contains everything you could need to do yours, and your friend’s, nails. The selected colors are perfect for every day wear, and there are a couple of sparkly ones for going out. I was impressed with the number of items that are included in this kit, especially the foldable curing lamp – what a great idea. With the USB it can be plugged in anywhere – your car, your phone charger, or computer etc. Making nails beautiful while camping, for example, has never been easier! You can also use other polishes with it; I tried a holographic powder and just couldn’t stop staring at my nails. Although the colors included are perfect, I tend to be a bit braver with my style, so am really pleased that you can use any brand/color you wish. The bottles are a little on the small side, but that’s okay as I’m mixing in other shades, and the price is great for the amount of kit you get. TThis well stocked kit is awesome and would make an ideal gift for someone. I’m going to buying a couple for friends and relatives, maybe another one for myself!